It feels really great to be blogging again, and that too about such an exciting collaboration! Let’s just dive in right away! I have so much to tell you. So, nested nicely in the heart of Kitsilano, is a quaint boutique called Two Of Hearts. Every time I visit, I want to buy simply everything! This place glistens with the most chic accessories like leather gloves, bowed hats, delicate jewelry, scented soaps and all kinds of clothes. Two Of Hearts is especially well known for the eco fabrics they use, which provides the best fitting and most flattering looks for all body types. The boutique carries merchandise of various brands from designers all over BC. It is always great to support local! Speaking of the brands they carry, Cici is one of them. This brand was created by the founder of Two Of Hearts herself, Jenny Yen. Fashion designer and entrepreneur! YES to woman power! Q:Where do you get your fashion inspiration form? A:”Fabrics, trends, modern and vintage movies, women fashion designers such as Donna Karen, Vera Wang”. Q:What advice do you have to young fashion entrepreneurs and designers? A:”Keep on working hard, be persistent, do what you love”. Q:What are your future ambitions for yourself and for Two Of Hearts? A: “I want to reach out to more customers across Canada, US and Internationally with on-line sales”. Jenny put together this Autumn-appropriate outfit for me, and I was very impressed! My tights and top are from Cici, made from bamboo cotton and spandex, they were super soft and breathable. Excuse my immodesty for a second, but they also fit so well I was staring into the mirror and smiling hard. Beautifully draped on top of my comfortable base, was this poncho by Chic editions. As you can see, it is a stunner, and comes in various colors! Get yourself styled here as well, Two Of Hearts offers personal shopping services, so you don’t have to waste too much time worrying about what looks better with what! How great is that? Visit www.twoofhearts.ca for more information about this inedible boutique, better yet go visit it at 1986 West 4th Ave, Vancouver. Oh, before I forget, here is some Two Of Hearts eye candy. Be inspired by these fashion forward looks! 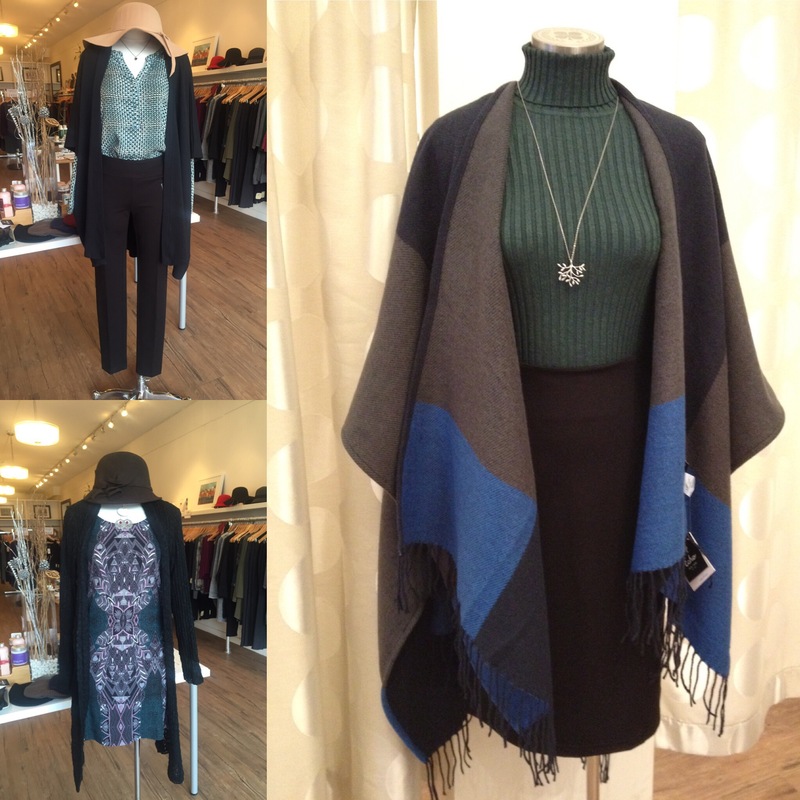 Top left: Colour block wrap by Echo Designs, ribbed turtleneck by Soya Concept, pencil skirt by CiCi Clothing, necklace by Sarah Mulder. Bottom left: Art Deco print sweater dress by Papillon, black cardigan by Teaberry, hat by Amanda Accessories. Right:Viscose Ober blouse by Soya Concept, oversized cardigan by Gilmour, pants by Lisette. Lots and lots of love! Have an amazing long weekend!